I have recently read a couple of Orson Scott Card’s sci-fi novels, ‘Ender’s Game’ and ‘Speaker for the Dead’. In the first of these, a young boy is intensively trained to become a military commander to fight ‘the buggers’, an alien race that at one point attacked humanity. Ender is trained for starship battle through the use of video games, and does become the military genius on whom the hopes of humanity are pinned. It turns out, however, that all is not quite as it seems. In the next book, set 3000 years later, Ender has become a Speaker for the Dead, who turns up when asked and recounts the truth of a dead person’s life: their real hopes and aspirations, as well as all the uncomfortable bits you’re not supposed to talk about. Central to this novel, however, is the presence of another alien race, ‘the piggies’, and Ender gets involved in humanity’s relationship to this race. At one point Ender is a professor at a university, and we are introduced to 4 levels of ‘otherness’ which humanity has come up with in response to its encounter with alien races (so far, just the buggers, who it eliminated, and the piggies, with whom humanity is super-constrained, super-PC even, as a sort of contrition for what happened to the buggers). The names themselves are a parody of how we view the ‘other’. The 4 increasing levels of otherness respectively describe a human from another part of this world, a human from another world, another species that is nevertheless regarded as human and finally another species that is not regarded as human, such as animals. Science fiction gives a freedom to explore ideas about what it is to be human in ways that ordinary fiction cannot perhaps do so easily. 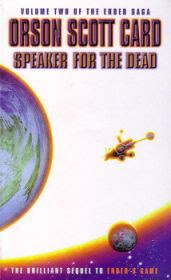 In Speaker for the Dead there is an anonymous commentator called Demosthenes, and a rather brilliant point he makes is that humanity’s ability to declare an alien species to be human is not a comment on the moral maturity of that other species, but on the moral maturity of humanity. I can’t help thinking of America in this respect, and its list of rogue nations, its ‘axis of evil’ (which the Obama administration is perpetuating). Orson Scott Card is an American. You can just see the generals out of Dr Strangelove calling the alien species ‘the buggers’ and ‘the piggies’, with no sense of irony or parody. The USA sets itself up as the moral judge of other nations. (For the astrology of this, see my audio-blog on America’s Preachiness.) For all Iran’s faults, America makes itself look ridiculous when it talks (as Obama did a few months ago) about wanting to admit Iran to the community of responsible nations. It will be a sign of America’s moral maturity when it is able to treat Iran as a nation just like itself, rather than as ‘other’. Then there may be progress. 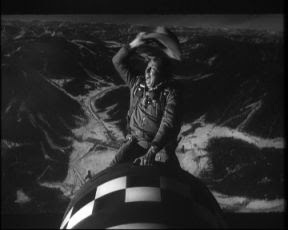 This doesn’t mean that I don’t think Iran should be stopped from getting nuclear weapons. I think it needs to be stopped. My point is that in trying to acquire nuclear weapons, Iran is behaving no differently to how America would behave in the same situation. Iran also has an ugly and intolerant ideology, but so does America. In a fundamental sense, nations are all the same, they have very similar motives. Which is why I don’t want to single out America here, because it is in the nature of nations and of people to consider themselves superior. I once read an anthropological book which cited a tribe in the Amazon who did not consider the neighbouring tribe to be human. These days we tend to idealise indigenous peoples and Tibetans (when you see the word ‘Lama’, think bishop, it cuts through all the hyperbole. 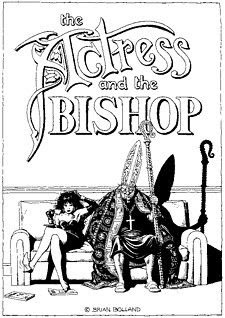 And when you think bishop, think Anthony Trollope’s Barchester Towers!) People have always tended to consider the 'other' to be less than human. So America is an example of not just how all nations will behave in certain circumstances, but also how people behave individually and always have behaved, and that is really what Orson Scott Card is getting at in what is not just an allegory but also a great story. Robert A Heinlein uses ‘otherness’ to raise taboo issues in his book Stranger in a Strange Land. What happens is that a human colony is set up on Mars, and everyone dies except for a human baby who is brought up by indigenous Martians, and who eventually returns to Earth. So he is physically human, but he thinks and acts like a Martian, in ways that are completely incomprehensible to humans. 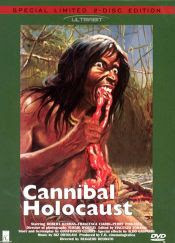 This first of all relativises the way we look at the world, but Heinlein goes beyond this and has the Martian human breaking just about every taboo going, including ‘free love’, murder and cannibalism. For him, it is an honour to be eaten after you’ve died, while ‘disappearing’ people who are threatening you is not a problem. In Speaker for the Dead, Orson Scott card also looks at the murder taboo, when ‘the piggies’ kill a couple of people in a really gruesome way, but from the piggies point of view they are honouring the humans; eventually both sides have to discover the other’s point of view. The point about taboos is that they are absolutes, they are laws written in stone, so consideration of their merits and demerits is impossible: to think about a subject, you have to suspend your idea of what you think the conclusion should be, and with taboos many people would think you are some kind of pervert if you did this, like you were half way to breaking the taboo. Paedophilia has entered the taboo zone much more strongly in recent years, paedophiles are the modern witches. I’m not trying to defend them, but rather to make the point that intelligent thought about this subject has become increasingly difficult. There always have been and always will be taboos, these moral areas that cannot be questioned without bringing the questioner under suspicion. After Stranger in a Strange Land was published in the early 60s (presciently, given what happened later in the decade), half of the USA thought Robert A Heinlein had lost the plot, and the other half thought he was a genius. So these authors are serving a necessary function within the tribe, dragging back into consciousness parts of the collective psyche that have drifted into darkness and judgement. Of course, not everyone will thank them for it. As some guy said a while back, no man is a prophet in his own country. I read the Ender series last year and it profoundly influenced my thinking. LOVE those books. I read Card's books back in college when they were published and it is interesting to be reminded of them. Prejudice is relative and becomes inexplicable to anyone else who does not understand the social consciousness of the taboo. Very deep ideas that are difficult to elaborate, but quite enjoyable to see a fellow thinker take on the challenge. Thank you. Your description of the difficulty in having intelligent discussions about taboo topics is well-put. I've been wondering about the taboo around cloning humans. WHY is this possibility considered to be unethical? My perception is that whatever is considered abominable about breaking a taboo is usually created as a response to the taboo, not an intrinsic property of the taboo-breaking itself. The psychological scarring is inflicted in response to the breaking of the taboo on both the breaker and the victim (if there is one). an example of this could be gleaned from an examination of the life of Oscar Wilde. Kenna J., is that a rhetorical question? The ability to clone a human would be to convey absolute control over the entire human race. Who would we trust to hold that power? Our governments? An appointed committee? Any doctor who chose to learn to do it? Think about it--to what point would you actually clone a human? Medical? Consider, if you clone a person for the purpose of providing "spare parts", do you not then literally kill the clone if you use those parts? But it is HUMAN. Isn't that then murder? Sentimental? Ok, you miss a loved one. It is fair or right to clone them? Can an original truly be replaced, as a human is more than the sum of their physical body? And how does that allowance for "replacing" loved ones for purely personal reasons impact our earthly resources and overall population? Do others then have to restrain from breeding, so that we as a race have enough "placeholders" for cloned humans without endangering our own subsistence? Practical? Perhaps we might clone ideal athletes, entertainers, scientists, etc., to increase our total resource of them. But, who then is entitled to decide who gets cloned? And justifies the purpose? And again, would a clone truly be identical enough to warrant the action? How might these possibilities infringe upon our freedoms? As individuals, nations, and as a race on the planet? And how might it also impact our evolution? Because cloning would not be creating anything new--it would merely be a continual rehashing of the old and/or already developed. Society is also largely against engineering humans--both potential as well as existing humans. Religious types will say it is a sin against God, who is the only one entitled to mess with humans. Secular people will argue that although ostensibly it could enhance us all, it could also all too easily endanger us all, and puts too much power over our very lives into the hands of a select group. Does that help you see the roots of this taboo and better understand the label "unethical" the action is given? I think we should carefully go ahead with human cloning and studying genetic manipulation. Eventually we'll be able to become entirely new creatures based only on our imaginations. The human form does not have to stay constant. Going along with the science fiction theme and taboo theme of the original post, I recommend the Dan Simmons novels Hyperions, Fall of Hyperion, Endymion and Rise of Endymion. The themes explored are similar and in some cases even better developed. Yes, I liked Hyperion and the Fall of Hyperion, particularly the way he links it with Chaucer - these guys on a pilgrimage, each telling their story. The shrike was a bit confusing, though, and I didn't think the 2nd 2 books were as good. He has a facility for dreaming up new worlds, and he almost seemed to be doing that for its own sake in Endymion particularly. The 2nd books weren't as good, I agree. However, the ideas about the Pax (the Catholic church) versus the Ousters are really an amazing logical extension of the debates about human cloning and genetic manipulation. The Pax wanted to keep humans exactly the same whereas the Ousters believed in altering the course of human evolution. Yes, he seems to come down on the side of the Ousters, from what I remember. But maybe it's a bit unfair of him to portray those who don't want to change human evolution as intolerant Catholics. I am reading Ender's Game just this last month, almost done. Wanted to say Hi and please feel free to send us something for TMA again -- maybe your take on July/August of 2010 -- should the urge strike you. But maybe it's a bit unfair of him to portray those who don't want to change human evolution as intolerant Catholics. It might be a bit unfair, but there is a kernel of truth (lapsed Catholic here myself).